The Department of Education awards program recognises and rewards staff and volunteers who have demonstrated outstanding excellence, innovation and talent in their roles supporting education. 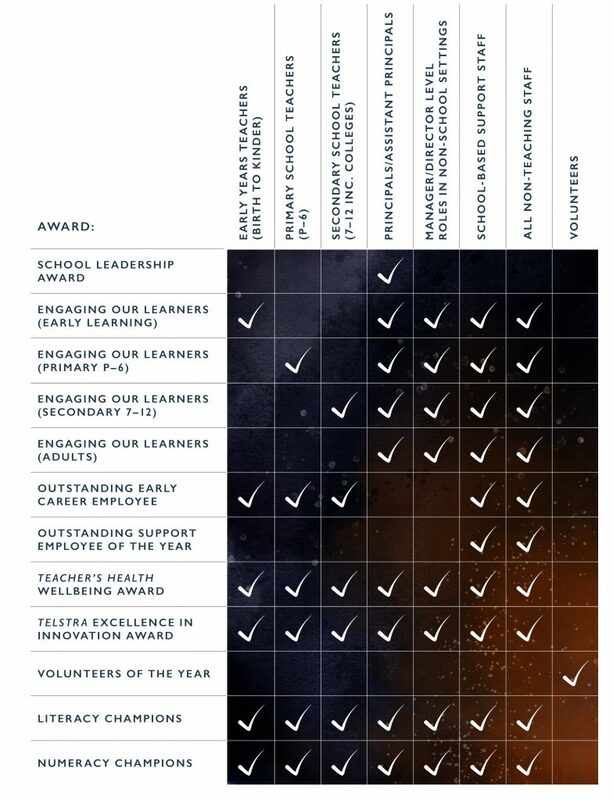 Now in its eighth consecutive year the 2019 Awards program embraces a suite of categories that are based on the Department’s core values of Aspiration, Respect, Courage, and Growth which we believe represent who we are as an organisation, and also reflect the attributes our learners will need to be successful. Nominations are open to all staff who are current employees of the Department of Education, including volunteers. Nominations must relate to work undertaken and achieved by the nominee/team between 1 January 2018 and 1 January 2019. 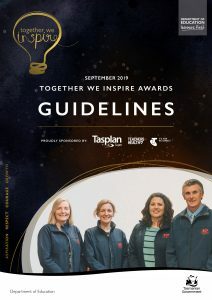 These awards, an important initiative of the Department, would not be possible without the generous support of our major sponsor Tasplan, and partners Teachers Health and Telstra. These awards, an important initiative of the Department, would not be possible without the generous support of our major sponsor Tasplan, and partner Telstra. RBF Awards Finalists (2016) – Photos at the Department of Education Flickr page.